Posts related to technology in general. We cannot continue to support Internet Explorer 11 any more, for the simple reason that Microsoft itself doesn’t want to support IE 11 any more. All of Microsoft’s browser focus is on their Edge browser, which means that as newer HTML5 features and standards get adopted by the browsers, these are going to show up in Edge, not IE 11. And since Kerika is a pure Web app, one that requires you to download no software of any kind, including browser add-ons and plug-ins, we really need to make use of the latest HTML5 goodies that the browser vendors provide. These goodies are going to be available only on Chrome, Firefox, Safari and Edge, and that’s where Kerika is gong to work best. As you know, Kerika is a Web Application: everything runs inside a browser, without the need for any plug-ins or add-ons. This caused problems for all of our Internet Explorer 11 users — people using Chrome, Safari, Firefox or Edge were unaffected. We finally figured out what the underlying problem was, and did a workaround using a polyfill, which is a way to provide new functionality in older browsers that don’t support it natively. A board can be made public to everyone. This makes sense for open-source projects and many nonprofit and advocacy groups, where the goal is to get maximum visibility and publicity rather than to hide the details of what the project is about. Making a board public means that anyone who has the URL of the board can view it, even people who are not Kerika users. Note: we are talking about viewing the board; viewing doesn’t mean anyone who isn’t part of the board team can make changes. If a board is viewable by the public, it can be found by anyone using Kerika’s search function. A board can be viewable by everyone who is part of the account team. This is the default setting, and it makes a lot of sense for most organizations: you want your coworkers to be aware of what your team is doing, unless the project is particularly sensitive. An account team consists of everyone who is a Team Member or Visitor on any board owned by the account. 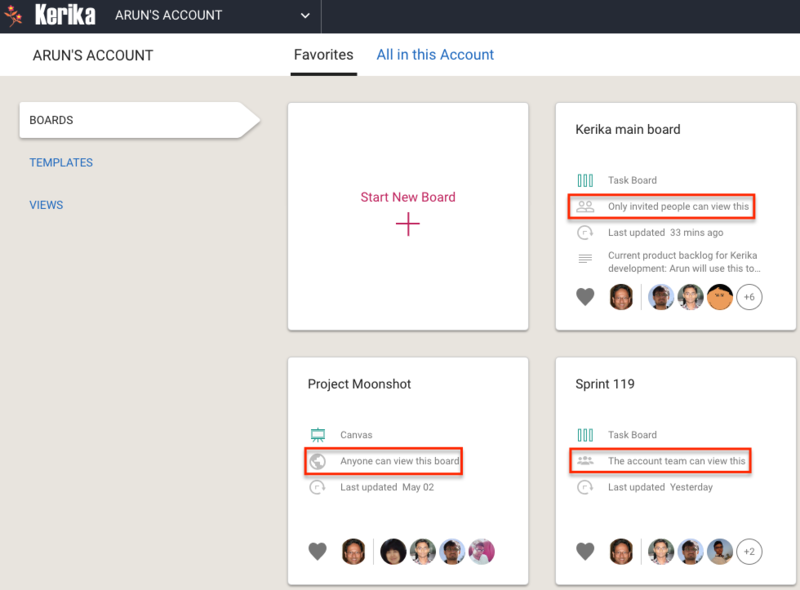 As people get added to individual boards, they are also automatically added to the account team. When someone is removed from every board owned by an account, they are automatically removed from the account team as well. If you use Kerika’s search function, you can find boards that are being shared with the account team, provided you are part of that particular account team. This is appropriate for any sensitive projects, e.g. stuff related to personnel matters or confidential contracts. Private boards can’t be found by Kerika’s search function either, and it doesn’t matter if you know the URL for the board: only the specific people listed on the board team can see anything related to that board. 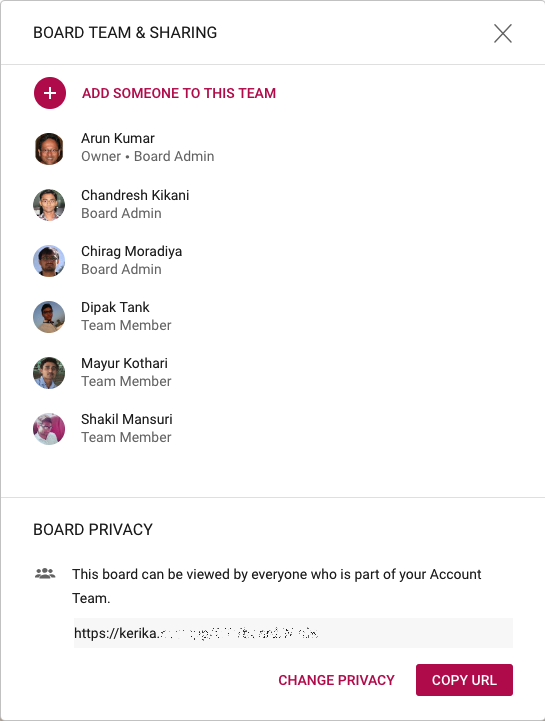 For each board owned by an account, the Account Owner or Board Admins can manage the board’s team: decide who is part of the team, and what sort of role (Board Admin, Team Member, or Visitor) each person has. 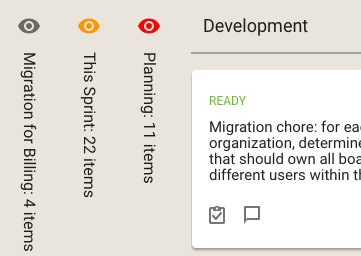 Board Admins and Team Members can make changes to all the items on the board, including any documents attached to the board. Visitors have read-only access to the board and all its documents. A person’s role can be changed at any time by the Board Admin or Account Owner: the effect is immediate, and extends to all the documents associated with the board as well regardless of whether you are using Google or Box for your file storage, or whether you are storing your files with Kerika. Each person who is part of the Board Team is listed in this dialog, in alphabetical order along with their role. 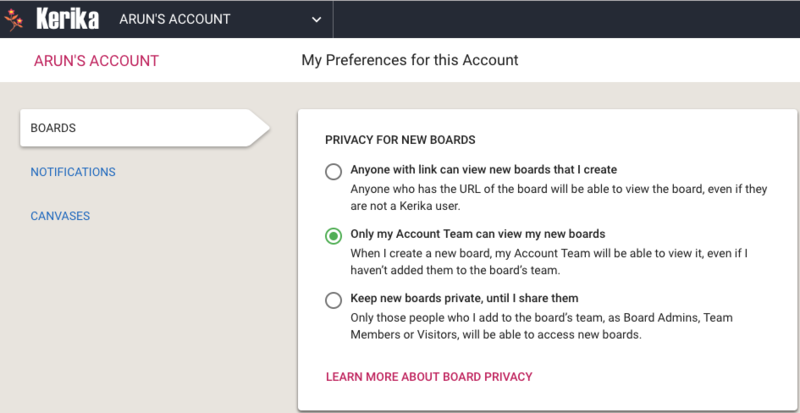 So, every board can have it’s own privacy settings: private, shared with account team, or public. If you are part of someone’s account, you will be able to create new boards in that account: you will automatically be a Board Admin on those new boards, but the owner will always be the account you are working in. All your preferences can be set at https://kerika.com/preferences. The default setting is Share with Account Team, which works well for most people, most of the time. For some segments of our users, e.g. college students using Kerika for their course projects, it makes sense to treat each user as an independent entity, since the relationships between these students will vary from class to class, from semester to semester. These collaboration networks are very dynamic, and it’s impossible to predict whether a team that got together to work on a three-month class project will stick together after that project is over, or work as the same group of people on the next class project. In business environments (companies, nonprofits and government agencies), however, the teams are more stable: people don’t change jobs every few months. But, turnover can still be a problem: if Joe leaves your company, how can you be sure that all the boards and documents that Joe had created are not lost along when Joe is gone? The simple solution to this is to use service accounts to own all the boards that are being used by a community of users, like a department or even the entire company (if the company is small enough). A service account looks like any other Kerika account — it is associated with it’s own email, e.g. kerika@example.com — but it isn’t actually a real person: the email will have been set up by the organization’s IT staff or management, and the password is typically shared between a small handful of supervisory people. This means the organization has continuity and security with respect to it’s Kerika boards and documents: because the project assets are owned by kerika@example.com, rather than joe@example.com, it doesn’t matter whether Joe is still working at the company or not. All the boards owned by the people in your organization will be transferred to the ownership of the service account instead. You can decide who to consolidate within the service account: typically it is everyone in the organization, but if you have different departments or cost centers, it will make sense to have more than one service account — one for each department or cost center. After the consolidation, individual users within your organization will no longer have separate accounts: their Kerika identity, preferences, history, etc. are all preserved, but instead of working in several different accounts, they will all be working in a single service account, that’s under the control of your organization. All this can be done by us, overnight: the next day your users can come into work and login as they did before, and have access to all the boards they had the previous day. All the boards will look the same, and your users can pick exactly where they left off. When users have been consolidated within a service account, any new boards that they create will automatically be owned by that service account, rather than by the individual users. This ensures that all current and all future project assets are owned by the service account, i.e. by the company, rather than by individual users. It’s still possible for individual users to have privacy within the service account: for sensitive work (e.g. personnel matters) they can adjust the privacy of individual boards to be “share with board team only”. When the privacy is set to board team only, the board will be visible only to the people who are specifically added by the Board Admins to the board’s team. The Account Owner, i.e. the service account, will always have access to every board within that account, regardless of the board’s privacy settings. This is consistent with how other organizational assets are currently managed: if you have a work email, for example, you expect to have privacy from your coworkers, but you know that the company’s IT department will always have access to your email if they need it — and your email doesn’t really belong to you, but to your employer. We have mentioned below the problems we had with GoDaddy’s SSL certificates; we have fixed this by switching to the open-source certificate authority called Let’s Encrypt. Let’s Encrypt is a free, automated, and open certificate authority brought to you by the non-profit Internet Security Research Group (ISRG). It lets us host our own certificates, so we don’t have to rely upon third parties and can have better control over the quality of our service.